All of our desserts are custom made in the store! Or come in to choose from our Ready-to-Go selection! 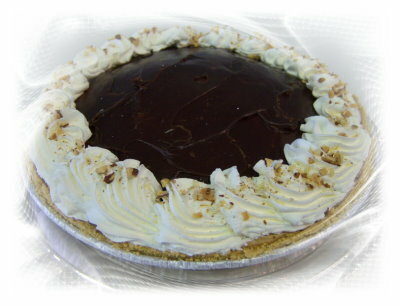 Chocolate pie crust, a layer of fudge, cookies & cream ice cream, topped with cookies and whipped topping. We start with a graham cracker pie crust, add a layer of bananas, then a layer of strawberry ice cream, topped with pineapple, then add layers of chocolate and vanilla ice creams, finishing with chocolate and marshmallow toppings, bananas, almonds, and cherries!